Make C.R. Kelley Janitorial Service your first choice! We provide the highest quality Janitorial Service, Cleaning Service, Carpet Cleaning, Rug Cleaning, Restroom Cleaning, Building Maintenance, and Janitorial Supplies available in the Lehigh Valley areas. We’ve been proudly serving Palmerton, Lehighton, Bath, Allentown, Bethlehem, Easton, Whitehall, Nazareth and Lehigh Valley areas for over 29 years! We offer daily/weekly/bi-weekly/monthly/one-time professional cleaning services as well as special event cleaning! We are locally owned and operated. You can turn to C.R. KELLEY Janitorial service with confidence! We pride ourselves on our very personal attention. You will deal directly with our owner and your satisfaction is his first priority! Our commercial janitorial service will keep your business running smoothly and keep your customers happy while visiting your building. We are available day and evening, so we will never disrupt your business. We use the best in professional cleaning equipment and cleaning products so you can rest assured the job is being done correctly. With 23 ½ hour janitorial services, we can work with any time schedule no matter what your opening hours are. We work around your schedule. No time is bad for our schedule. Our team members are experienced and have been with us for years, so you can trust that your business is in safe hands with our cleaning services. 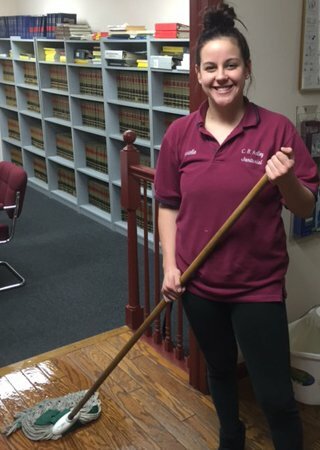 We are proud to serve local Lehigh Valley businesses with top-of-the-line cleaning and janitorial services guaranteed to make the best impression on customers and employees alike.